Differential pressure (DP) flowmeters composed of an orifice plate, a DP transmitter, and other components are widely used in many applications because they are reliable and require no wet calibration. The simple design of orifice plates and modern DP transmitters make them extremely reliable. However, the impulse lines which transmit process pressure to the DP transmitter are vulnerable to blockages caused by fluid condensation, freezing, or corrosion. Impulse line blocking is a problem that must be addressed to ensure efficient operation and maintenance. Yokogawa's EJX series DP transmitter is equipped with a silicon resonant sensor that can rapidly detect both static pressure and differential pressure. These features enable the development of a diagnostic technique which detects fluctuations in static and differential pressures. By using a digital communications network such as fieldbus, operators can determine whether an impulse line at a specific installation site has been blocked. Such information can significantly reduce maintenance workload and cost. Informs operators/maintenance engineers that a blockage is forming in an impulse line before the process is disrupted. Predicts when the impulse line will be blocked and suggests a corrective action, based on blockage thresholds. Blockage thresholds are determined based on blocking substance, flowrate variation, and the time required for taking corrective action. Fluctuating components of differential, static pressures generally decrease when an impulse line is blocked. Fluctuating components are calculated as the square summation of the difference of differential and static pressures that are sampled at very short time intervals. The amplitudes of fluctuating components are derived from the root of the square summation. Since these components are affected by flowrate changes, they are provided as fluctuation components through flowrate compensation. Table1 shows the value of the fluctuating components when blocking occurs on the Hi-side, Lo-side, and both sides. The values for when no blocking occurs are also shown. When both sides of impulse lines are blocked, all fluctuating components decrease. When one side of an impulse line is blocked, the corresponding fluctuating component decreases. In this case the fluctuating component of differential pressure is larger than when no blockage occurs. Blocking factor F is determined as the correlation function between the amplitudes of fluctuating components. It approaches +1 for high side blocking and -1 for low side blocking. Figure2 shows the Blocking factor F for each blocking type. This diagnostic function is currently available for low viscous liquids only. Traditional-mount Differential Pressure Transmitter based on the EJX-A Series. Differential Pressure Transmitter attached to an IFO assembly based on the EJX-A Series. Differential Pressure Transmitter with Remote Diaphragm Seals based on the EJX-A Series. Traditional-mount Differential Pressure Transmitter designed for Draft Range applications based on the EJX-A Series. Traditional-mount High Static Differential Pressure Transmitter based on the EJX-A Series. Flanged-mounted Differential Pressure Transmitter designed for Liquid-level applications based on the EJX-A Series. Traditional-mount Absolute Pressure Transmitter based on the EJX-A Series. Traditional-mount Gauge Pressure Transmitter based on the EJX-A Series. Gauge Pressure Transmitter with a Remote Diaphragm Seal based on the EJX-A Series. Traditional-mount High Gauge Pressure Transmitter based on the EJX-A Series. In-Line Mount Absolute Pressure Transmitter based on the EJX-A Series. 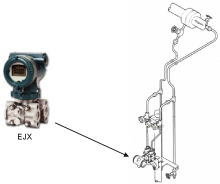 In-Line Gauge Pressure Transmitter based on the EJX-A Series. High Performance In-Line Mount Absolute Pressure Transmitter based on the EJX-A Series. In-Line Mount High Performance Gauge Pressure Transmitter based on the EJX-A Series. This transmitter precisely measures differential pressure, static pressure, and process temperature; then uses these values in a high-perfomance on-board flow computer to deliver fully compensated Mass Flow. Designed specifically for high static pressure applications, this transmitter precisely measures differential pressure, static pressure, and process temperature; then uses these values in a high-perfomance on-board flow computer to deliver fully compensated Mass Flow.